Currently browsing posts filed under "College GameDay"
Saturday, the 5-2 Ephs take on the 5-2 Lord Jeffs in a battle for second place in the NESCAC. Amherst’s seniors will be particularly fired up after three straight blow-out losses to the Ephs; they certainly won’t want to graduate with a bagel. Amherst is likely a slight favorite at home against a banged-up Eph team, which lost three of its projected starting front seven, as well as its top receiver, to season-ending injuries. The Ephs are, however, riding high after a homecoming triumph over Wesleyan. 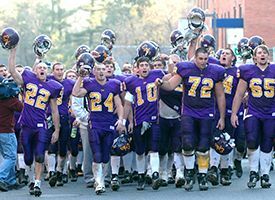 (Which reminds me, Eph lore question — do the Ephs perform “the walk” only after Amherst homecoming victories, or after Wesleyan victories as well?). For those new to the rivalry, I posted last year a conglomeration of the best web links on Williams football and Williams-Amherst in particular. Be sure, also, to watch last year’s awesome ESPN Gameday broadcast. I will never tire of watching Corso don the purple cow head. On an individual level, keep an eye on Brian Morrissey ’09, who after a monster season needs only 48 yards to break the Ephs’ all-time rushing record. Also on tap this weekend in Eph athletics: the Eph women’s soccer juggernaut hosts the NESCAC championship, and Eph men’s soccer heads to Middlebury for the same. This WSO thread between fans and critics of College GameDay participation got a little too heated for my tastes. Profanity is rarely persuasive. Read the whole thing if you have a lot of time on your hands. There are so many important ideas and life skills to be gained from playing sports. Athletics can bring about just as much passion within a person as any piece of art. You gain a sense of competitiveness that is extremely necessary in many careers you might pursue later in life, and people who have never played sports just don’t have that drive to win or succeed. Also, people that are strong in athletics AND academics (most athletes at Williams) are the ones who go on to become CEO’s or political leaders, not the math genius who has never stepped on a playing field. 1) The two Ephs who have probably made the most money in the last 20 years are both athletes: Bo Peabody ’94 (skiing) and Chase Coleman ’97 (lacrosse). Chase has probably made more money just this year then all the other graduates of Williams put together. Chase was captain of the lacrosse team. 2) In the last few years, three Ephs have been S&P 500 CEOs: Clarence Otis ’77, Mayo Shattuck ’76 (squash, captain of the tennis team) and Henry Silverman ’61. The alumni directory does not list any sports for Otis and Silverman, which probably means that they did not play. Can any readers confirm? 3) The most successful female Eph in business is trustee Laurie Thomsen ’79 (tennis and soccer). 4) Among political leaders, we have former Congressman Ed Case ’75 (rugby), Congressman and Senate-candidate Mark Udall ’72 (golf), former Governor Arne Carlson ’57 (football and wrestling). Clearly, this is not enough data to draw firm conclusions. My sense is that, among male Ephs who are very successful in business and politics, athletes are more common than they are in the Williams population. But I think that the reason for this has nothing to do with athletics per se. Both success in business/politics and success in athletics are helped by common factors: competitiveness, ambition, work-ethic and so on. These factors explain the correlation, not anything that athletic participation itself produces. The key GameDay clip is already up on YouTube. Pat Lucey as the Pontiac Game Changer, Corso in the purple cow head, it just doesn’t get any better than that. Thanks to a reader for a link to the GameDay preview. Ephs need only watch the first 30 seconds or so. Was that a couple of women soccer players with a cute sign about their game? Good stuff! Women’s soccer won 1-0 while football handled Amherst easily, winning 20-0. I missed both games so perhaps a reader could provide details. I am having trouble seeing this on a Mac, but this link provides a preview of College GameDay, including an appearence by Erin Burnett ’98. (Thanks to an anonymous comment. All GameDay related posts are here.) Is there any way to display this video nicely on the blog? Perhaps some could place it on YouTube? By the way, I was thinking of live-blogging this event, if only to avoid doing actual work . . . There continues to be no mention on the Williams homepage of the forthcoming ESPN College GameDay festivities. The fancy new athletics page does mention the story and provide a link to the full description. Why no link on the main page? Perhaps Director of Public Affairs Jim Kolesar is waiting for permission from Professor Cheryl “Nike Camp with enrichment classes” Shanks. Just wondering! It is almost as if the College administration is embarrassed by the event . . .
Kim Dacres: Dude…unnecessary. Don’t embarrass yourself any further. Tacher: Even though I won’t be able to go to the tailgating/game, if other people can remark about not embarrassing ourselves with drunken escapades, then I feel it is necessary to remark about other things that could be embarrassing. James Matthews: Yeah. Organizations that are completely devoted to school spirit and supporting student-athletes are awfully embarrassing. I hate that. Andrew Goldston: You might want to put down that shovel, Jordan. I think that there is a deeper issue here that has not been bought up. What does it say about us if we are embarrassed by Mucho Macho Moo Cow Marching Band? What is it that one values if this marching band is something that one do not want associated with oneself? You imply that the reason that they embarrass you is that there music is “cacophonous”–you think it is bad. But I don’t think that can really be the case. Are you honestly saying that the reason that they embarrass you is because they do not make pleasant music? that there are not talented or well rehearsed? No, that is certainly not the case. I suspect that really what might be embarrassing is that they are, as trite as this sounds, quirky…different. If this is the case, then I think that is a fairly accurate definition of intolerance–malice towards that which is different. Never mind that, what is there to be embarrassed about? They are good, fun, funny, well-meaning, entertaining, and all-around Eph-like. The kind of thing we ought to want as a reputation of our entire school. 1) Tacher does have a point about the double standard with regard to mocking on WSO. You can make fun of drunken antics but not of the band. The differences, of course, are: a) The band hurts no one while drunken antics often negatively impact the quality of life for other Ephs and b) The band is a well-defined group of individuals whereas most/all drunken-mocking does specify who the guilty party is. Now, if he could cite a WSO post in which someone mocked a specific group of drunk Ephs (football players?) who weren’t bothering anyone, he might have an argument. 2) Kaplan’s point about intolerance highlights for me another of the bad effects of the College’s endless prattle about diversity. The College acts as if the big problem among students relates to racial differences and the like, as if lots of, say, white students make fun of Asian students for being Asian. That barely happened 20 years ago! Now, such mocking has almost vanished, just as anti-Catholic sentiment had disappeared from Williams 50 years ago. But lots of (mean) mocking still goes on. You can be certain that Tacher and his ilk mock the band, just as others make fun of athletes or (harmless) drunkards or, hard as it is to believe, bloggers. Why the hate? Well, “hate” is probably the wrong word and a little bit of mocking never hurt anyone. But the problem with the College’s obsession with race is that it takes away from a more appropriate obsession with manners. (And, yes, I need to work on my manners as well.) The College has a limited ability to, in former Dean Peter Murphy’s phrase, shape the “hearts and minds” of her students. Instead of wasting that capital on another effort of stamp out racial crimethink, Williams ought to focus on better manners. If the College had done so, then Tacher would understand why his post was a mistake. For Ephs who are a little rusty on Williams-Amherst lore, skeptical Division I fans, or ESPN producers looking for storylines, I’ve tried to assemble here the most interesting resources discussing the Eph-Jeff rivalry, and about Williams football, generally. First, espn.com posted stories on the rivalry in 2000 as well as this past July. Chris Fowler today added a great story in anticipation of the GameDay event. In October, 2006, the Boston Globe featured a fantastic slide show titled “one fall day” which featured photos of the Ephs’ thrashing of the Middlebury Panthers. Also in 2006 (which must have been an especially beautiful football autumn), cnnsi.com featured Williams in a fantastic series of “tailgate nation” photos. Last fall, the New York Times published a nice story on Williams’ preparation for the Amherst showdown. In 2002, the Times published a more controversial story on the backlash against Williams’ football (and general athletic) success. Back in 1995, leading up to the infamous 0-0 tie suffered on an essentially unplayable field, the New York Times published a series of articles on the lead-up to the Williams-Amherst game: see part 1, part 2, part 3, part 4. Here is another NYTimes article, this one from 2001, discussing the tradition of joint Amherst-Williams telecasts at sports bars around the country. Williams sports information maintains a page of “Eph legends,” featuring interesting stories of individual participants in the rivalry. Finally, returning to the present day, be sure to watch the Ephs’ football preview show for a detailed look at Saturday’s matchup. The North Adams Transcript has a feature on the excitement surrounding gameday, and will have a game preview tomorrow. Williams alum Peter McEntegart has already posted about the game on his Ten Spot blog on cnnsi.com, and he promises more tomorrow. To make a long story short, go Ephs! This t-shirt seems to be popular with the kids today. No idea what Crank Dat refers to? YouTube may be of help. Credit for the idea goes, I think, to the Griffins. Kudos to all concerned. Drew Newman ’04 (longtime friend of EphBlog) makes an excellent suggestion. I hope that someone will remember to bring ACE’s giant fiberglass purple and gold cow to the game. 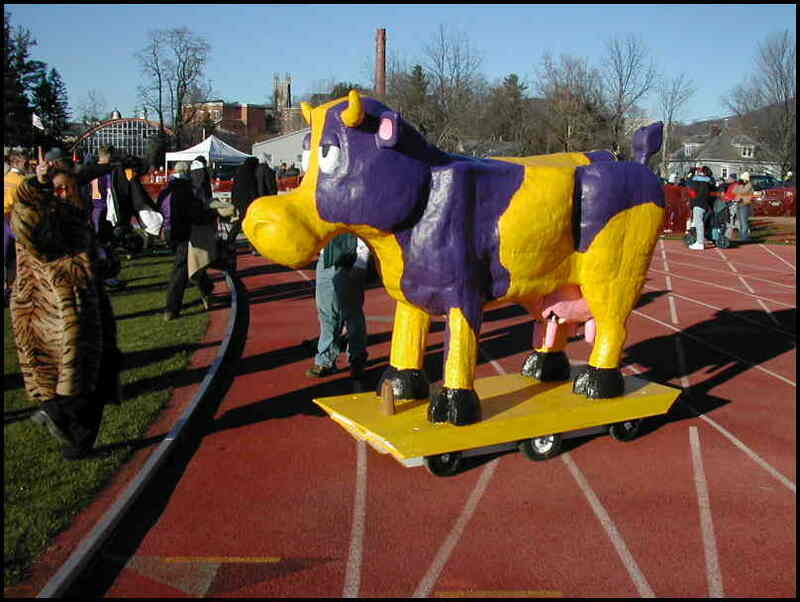 It’s about 8 feet long and 6 feet tall, and was built in 2002-2003 by Jamie Gardner ’03 (after Wesleyan stole ACE’s previous purple and gold cow in an act of violence at Homecoming 2002). The ACE cow is named “Moo-orty” and lives in Sewall Garage. It rolls on a wheels, but at a party can be setup so that beer flows through its udder. 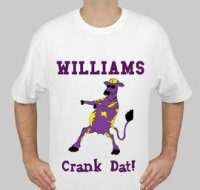 “Moo-orty,” the giant ACE purple and gold cow is a great example of unique Williams spirit. By the way, did you click on those links next to Drew’s name above? Good times! If I could draft only one person to join EphBlog in 2007, it would be Drew. What do you say? 2) Can someone with HD reception please tape the show? If you send me the DVD, I will grab all the Williams-specific shots and post them on YouTube for all to see. 3) We need to brainstorm about clever stunts that students can pull. Make your suggestions here. Nothing wrong with wearing purple and screaming loudly, of course, but surely we can do better. How about a moment when everyone behind the set goes quite, whips out a book, and starts reading silently? How about punny, intellectual signs? “Give Us Back Our Library!” “Out, Out Damn Small Pox!” Obviously, this is not my forte. I realize that the theater major crowd are not usually GameDay fans, but Saturday provides a chance for nationwide exposure to creative displays. A float with Mark Hopkins and a student on the log? Something about Lord Jeffrey Amherst giving Small Pox-ridden blankets to the Indians? Other suggestions? EPSN is coming to Williamstown. ESPN’s College GameDay will originate Saturday from Williamstown, Mass., site of the football game between Amherst and Williams in the 122nd meeting between these rivals. The show will air at 10 a.m. on ESPN. I hope that they give some air time to the Moocow Band, for which my father played 50 years ago. ESPN producers will no doubt appreciate other suggestions on what aspects of Williams to bring to their global audience . .
EphBlog is powered by WordPress and delivered to you in 0.966 seconds using 30 queries..